Repair, replenish, and reveal your new smile today. Turn your problematic smile into a picture of function and beauty at our cutting-edge dental office. There are times where oral disease, trauma, or normal wear and tear can become so damaging that it may take a variety of dental treatments to restore your smile. Even with the most complex of dental worries, you can put your trust in the hands of our experienced LVI trained dentist, Dr. Rudnick. He provides full mouth rehabilitation to those who are suffering from more severe dental issues. Full mouth rehabilitation begins with a neuromuscular focus. Improper bite and misalignment of the jaw can bring on debilitating symptoms, including migraine headaches, fatigue, stiff muscles, dizzy spells, and teeth grinding. 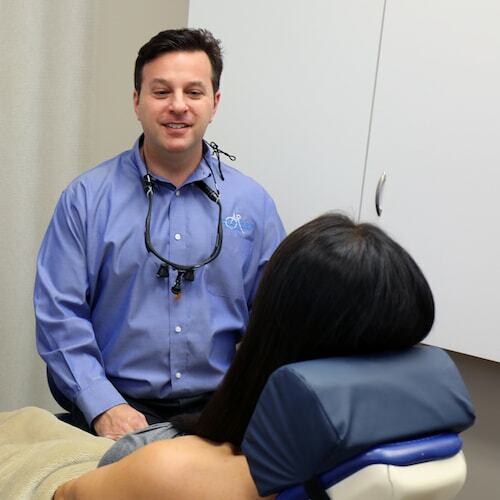 Our neuromuscular dentist trained at the prestigious Las Vegas Institute for Advanced Dental Studies, where he was specially educated to recognize signs of TMJ disorder. Once the neuromuscular phase of full mouth rehabilitation is complete, Dr. Rudnick will assess any needed restorative dental work and discuss a treatment plan with you. This may include few or many restorative treatments, such as dental implants, metal-free fillings, inlays or onlays, or bridges. Learn more about these below. After focusing on the function and health you desire for your smile, we’ll discuss your desires for aesthetic treatment with Dr. Rudnick. These dental treatments focus on giving you the healthy, gorgeous smile you’ve always dreamed of. Three comprehensive stages, one brand new smile. We carefully adjust your jaw to rediscover function and relieve pain. Dr. Rudnick uses a range of treatments to restore your teeth. Beautify your smile with our world-class cosmetic services in Palm Beach County. Your first choice for full mouth rehabilitation in Palm Beach Gardens, Jupiter, and West Palm Beach. Your neuromuscular dentist, Dr. Rudnick, has a Fellowship at the acclaimed Las Vegas Institute for Advanced Dental Studies. This means he has completed training in both advanced aesthetics and neuromuscular science. At Rudnick Dentistry, we have years of experience diagnosing and treating TMJ disorders. We use modern technology and the latest techniques to realign your jaw and help you overcome common symptoms. We have helped hundreds of people achieve beautiful and fully functional smiles. Our caring team is very proud of the amazing results we provide to each patient who comes through our doors. Build a foundation for teeth that act, feel, and look as natural as the teeth you were born with. The trauma of a missing tooth can truly be debilitating and can negatively affect your confidence. Dr. Andrew Rudnick can protect the health and beauty of your smile while restoring your confidence. How? By using dental implants, the number one solution for replacing missing teeth. A dental implant is a synthetic replacement for the root of your missing tooth and can be used for one or more missing teeth. The implant mimics your natural root and is topped with a crown to reinstate the vitality of your smile. To assure precision, fit, and functionality, Dr. Rudnick uses the innovative SIMPLANT system to help him place guided implants. Learn more about this modern treatment and how you could benefit from dental implants by clicking the button below. Book and see how we can save your smile.